Americans tend to fear death. It makes us uncomfortable. Yet death is inevitable. Its inevitability should teach us to revel in the richness of the here and now. It should also teach us the foolishness of undue pride. All is vanity, the Bible teaches. Death reminds us of this — that human vanity, as unavoidable as it may be, is ultimately shallow. There are riches out there that we should seek away from the glaring and garish light of vanity. Riches that give deeper meaning to life. Of all cultures in the world, I wonder if there’s another that ignores or denies death as much as American culture. We’re the culture of new beginnings, fresh starts, reinvention, and also of the perpetual now, of youth, of defying or denying death through face lifts, cosmetics, adrenalin-driven adventures, and so on. Technology and consumerism also provide distractions. After all, how can I be nearing the end if I have the latest iPhone or iPad or if I’m wearing the latest hip fashions? Our funeral homes seek to deny death with open casket rituals in which the dead person is made up to look alive. Paul Fussell skewered this cultural tendency in his book, Class. We use euphemisms like “passed away” or “passed on” for “died”; the descriptive term of “undertaker” has morphed into “funeral home director.” Our religions stress life after death, not death itself. In minimizing the cost of war to its troops, the U.S. government and media also seek to deny the reality of death to the enemy. War coverage in the media is often stock footage showing drones or aircraft firing missiles, enhanced by graphics and music. You might see an enemy building or truck blowing up, but you’ll never see dead bodies. Too disturbing, even though violent gun play and bleeding corpses are routinely shown in American crime shows and movies as entertainment. 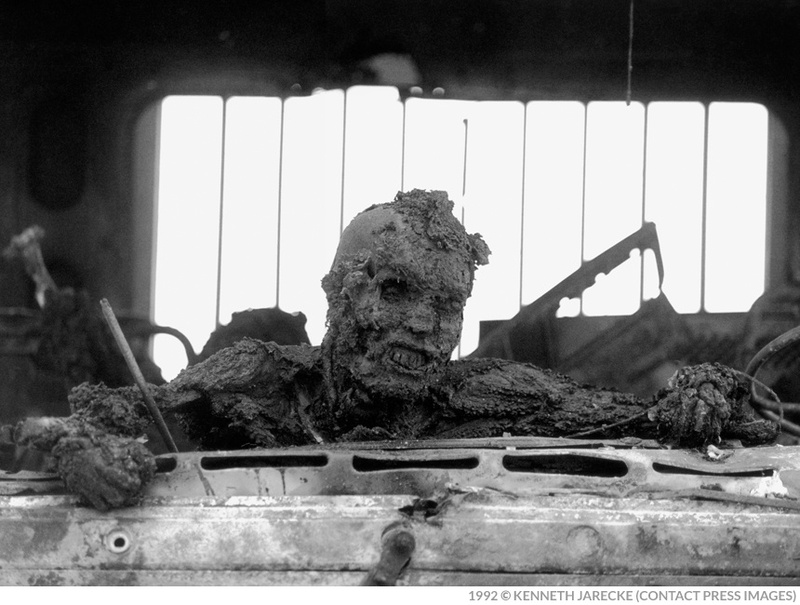 In the first Iraq war (Desert Storm) in 1991, the photographer Kenneth Jarecke caught a powerful image of a dead Iraqi soldier burnt alive in his truck on the infamous “highway of death.” Jarecke believed his photo would change America’s vision of the war, which in the U.S. media had been staged like a Hollywood production, neat and sanitary and clean. But no U.S. media outlet would publish the image. It was relegated to overseas publications. What price do we pay as a people by ignoring death? We lack a certain depth and maturity; put differently, we are callous and shallow. Death has little meaning to us, especially the deaths of those in other lands. For in seeking to deny the inevitability of our own deaths, how can we possibly recognize and process the death of others? A death-denying culture that rains death on others using drones named “Predator” and “Reaper”; a culture that finds images of war dead too disturbing even as its TVs and movies and videos are saturated by bloody murders. What are we to make of this? The most powerful speech I’ve seen in any movie is that of Chief Dan George in “Little Big Man.” In trying to make sense of the White Man’s war on Native Americans, Chief Dan George’s character, Old Lodge Skins, suggests that the White Man kills because he believes everything is dead already. 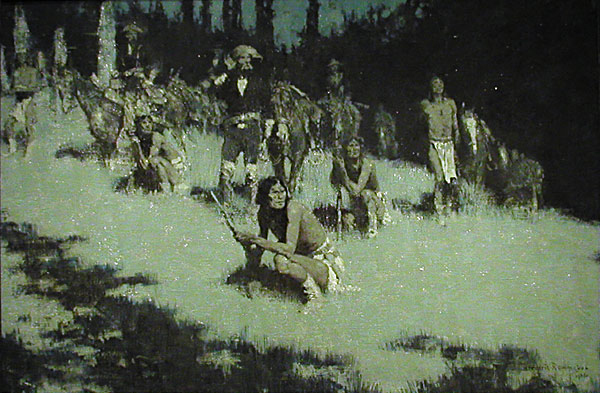 Lacking a moral center, the White Man has no sense of, or appreciation for, the sanctity of life. Do we deny death because in some sense we are already dead? Dead to the richness and sanctity of life? Random thoughts, as promised. But I hope they stimulate thought. What say you, readers?